Under the Direct Link Tracking section, add the direct link and then click the Update Affiliate button at the bottom of the screen to save your changes. A direct link added by an admin is automatically to an Active status, though the status can be changed by editing the direct link. 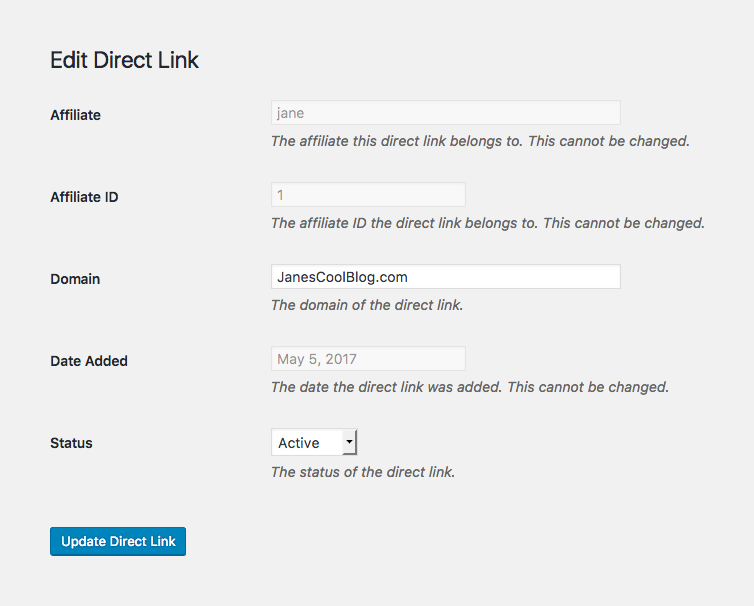 Under the Direct Link Tracking section, edit the direct link and then click the Update Affiliate button at the bottom of the screen to save your changes. Note, clicking Accept or Reject will send the relevant email notification(s) to the affiliate if the emails are enabled from the settings. See: Email Notifications. Change the Status of the direct link to either Active or Rejected. Note, changing a domain's status from Pending to either Active or Rejected will send an email notification to the affiliate if the emails are enabled from the settings. See: Email Notifications. 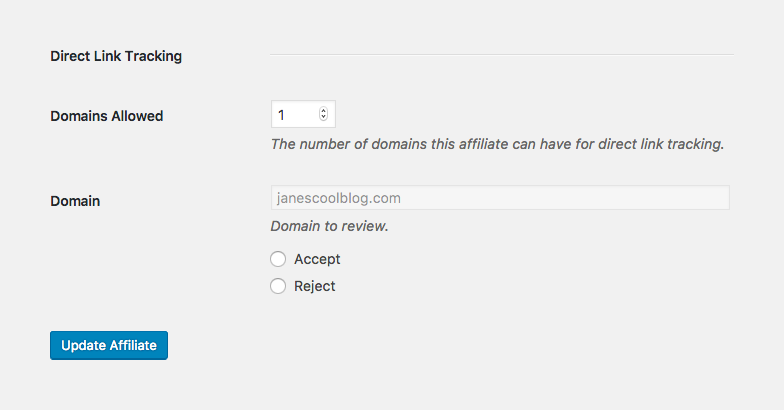 Under the Direct Link Tracking section, click either the Accept or Reject radio button for the domain. Multiple domains can be accepted and rejected at once. When you're done reviewing the affiliate's domains, click the Update Affiliate button at the bottom of the screen to save your changes. Note, choosing Accept or Reject and updating the page will send the relevant email notification(s) to the affiliate if the emails are enabled from the settings. See: Email Notifications.